Chennai: Both Prime minister Narendra Modi and President Pranab Mukherjee on Monday congratulated the Indian Space Research Organisation (ISRO) scientists for the successful launch of GSLV – MkIII D1/GSAT-19 mission. The country's heaviest rocket the Geosynchronous Satellite Launch Vehicle (GSLV) MarkIII D1 carrying communication satellite GSAT-19 lifted off from Sriharikota at 5.28 pm on Monday and was soon put in orbit successfully. President Mukherjee tweeted: Heartiest congratulations to ISRO on historic launch of GSLV-Mk III D1. Nation is proud of this significant achievement. In a series of tweets Prime Minister Narendra Modi also heaped praise on the dedicated ISRO scientists. The PM said, "Congratulations to the dedicated scientists of ISRO for the successful launch of GSLV – MKIII D1/GSAT-19 mission... The GSLV – MKIII D1/GSAT-19 mission takes India closer to next generation launch vehicle and satellite capability. The nation is proud." Congress President Sonia Gandhi on Monday congratulated the ISRO for the successful launch of GSLV MKIII-D1, saying it was another significant achievement which has made the nation proud. In a message, Gandhi said the ISRO had kept up the tradition of excellence in space sciences. Congratulating ISRO chairman A S Kiran Kumar, she said his team has made the nation proud once again on Monday. ISRO Chief A S Kiran Kumar also took the opportunity to congratulate the entire team which worked on this project. "It is a historic day.. both the GSLV Mk-III and the GSAT-19 launch have been successful.. we are looking forward to its (GSAT-19) operations," Kiran Kumar said. "This month there are lot of activities. On June 23, there will be a PSLV (Polar Satellite Launch Vehicle) and on June 28, a GSAT-17 satellite launch," he added. The ISRO scientists on Monday successfully launched the country's heaviest rocket GSLV-MkIII D1 carrying 3,136 kg communication satellite GSAT-19 from the spaceport of Sriharikota. The 25-and-half hour countdown began on Sunday at 3.58 pm and was "progressing normally". Scientists were currently involved in the propellant filling operations of the heaviest GSLV-MkIII D1, officials said. The rocket was scheduled for a lift off at 5.28 pm from second launch pad at the Satish Dhawan Space Centre, Sriharikota about 120kms from Chennai. Till now, ISRO had to depend on foreign launchers for communication satellites weighing more than 2,300 kg. The GSLV MkIII-D1 is capable of lifting payloads of up to 4,000 kg into the Geosynchronous Transfer Orbit (GTO) and 10,000 kg into the Low Earth Orbit. ISRO Chairman A S Kiran Kumar had said the mission is important as "it was the heaviest-ever rocket and satellite to be launched from the country". GSLV MkIII-D1 is capable of lifting payloads (or satellites) of upto 4,000kgs into the Geosynchronous Transfer Orbit (GTO) and 10,000kg into the Low Earth Orbit. 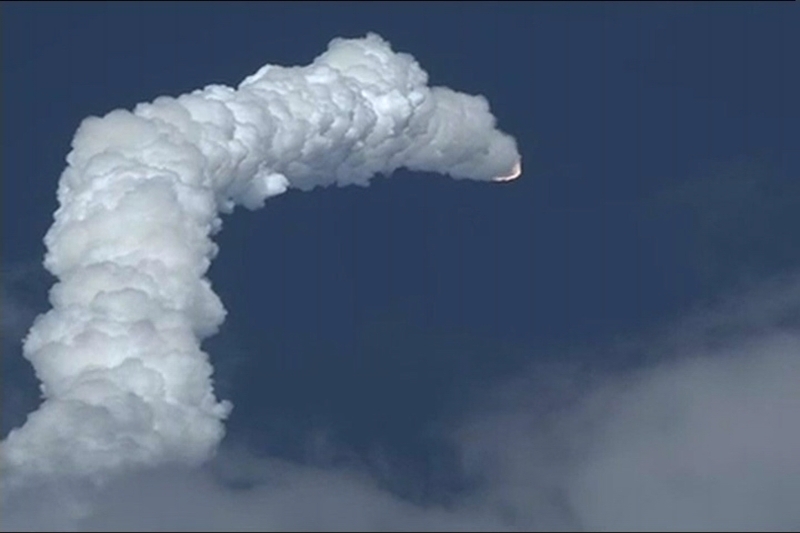 Earlier, ISRO had launched the 3,404 kg GSAT-18 communication satellite from Ariane, French Guiana. The GSLV-Mk III-D1 is a three-stage vehicle with indigenous cryogenic upper stage engine designed to carry heavier communication satellites into the GTO. Today's mission augmented India's communication resources as a single GSAT-19 satellite is equivalent to having a constellation of six to seven of the older variety of communication satellites. In 2014, ISRO had successfully tested the Crew module Atmospheric Reentry experiment with the flight GSLV MkIII. The module after making its re-entry deployed its parachutes as planned and splashed down in the Bay of Bengal.